By Alan Green in VectorVest on 28th March 2018 . Gulf Keystone Petroleum (GKP.L) is a leading independent operator and producer in the Kurdistan Region of Iraq and the operator of the Shaikan field with current production capacity of 40,000 barrels of oil per day. The Kurdistan Region of Iraq segment consists of the Shaikan, Ber Bahr blocks and the Erbil office, which provides support to the operations in Kurdistan. The UK segment provides geological, geophysical, engineering and corporate services to the Company. On January 22nd 2018, GKP published an operational and corporate update. GKP confirmed a net cash position of $157m as at Jan 19th 2018, and said gross production guidance for 2018 is being set at 27,000-32,000 bopd. The lower range compared to 2017 is due to the need to install downhole pumps in some wells, which are part of the investment programme delayed into 2018. GKP confirmed a strong safety performance in 2017 and into 2018 with no lost-time incidents at the Shaikan field. Operations in the area remain secure, and a plant uptime of 99% in 2017 helped contribute to an average gross production of 35,298 barrels of oil per day, in the middle of GKP’s guidance range of 32,000-38,000 bopd for the year. Subject to resolution of commercials and the Kurdistan Regional Govt continuing regular payment of monthly invoices, GKP intends on investing this year in wells and facilities to expand production capacity to 55,000 bopd. CEO Jón Ferrier said the board are “very pleased with the progress made to date on the commercial and operational matters to implement this and look forward to concluding commercial matters in the near future.“ Group FY results will be announced on Wed 11 April 2018. Despite GKP’s region of operations and the comparatively uncertain geopolitical picture, the company has over the past few months triggered a series of positive VectorVest metrics that cannot be ignored. In late December 2017, the VectorVest RT (Relative Timing) metric leapt higher, alerting members to a growth opportunity. 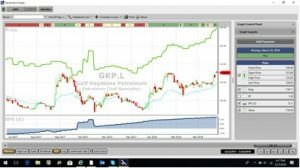 RT is a fast, smart, accurate indicator of a stock’s price trend, and despite the stock currently trading at year highs of 130p, GKP still logs a current rating of 1.29 on this metric, which is vey good on a scale of 0.00 – 2.00. Other high scoring metrics include a GRT (Earnings Growth Rate) of 30%, which VectorVest considers excellent. The uncertain geopolitical picture previously mentioned weighs on the RS (Relative Safety) metric, where GKP scores a poor rating of 0.82 (scale of 0.00 to 2.00), but despite this, trading at 130p the stock is still considerably undervalued against a current VectorVest valuation of 179p per share. 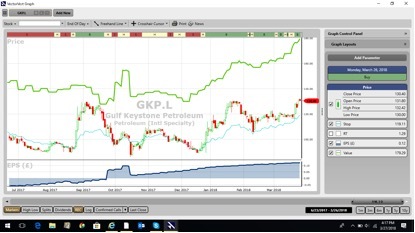 The chart of GKP.L is shown above over the past nine months. The share in this time has charted a treble bottom pattern and over the last few weeks a rising low. Price support within the rising low on the 12th February 2018 arrived at a previous swing top which was charted last November 2017. This is bullish price action. The share is undervalued with an excellent price appreciation potential (RV) and is on a BUY recommendation. Summary: GKP is probably one of the most familiar stocks to the investing community, on account of some huge historical share price movements and a somewhat chequered history. Regardless, as a trading and investing instrument, GKP currently offers a decent investment proposition to investors with an appetite for risk. Despite the poor RS (Relative Safety) rating, VectorVest takes the view that GKP offers significant upside given plans to the expand production facility. The very good RT (Relative Timing) rating in the run up to the results warrants a VectorVest buy rating, but investors are advised to run a close stop loss. Readers can examine trading opportunities on GKP and a host of other similar stocks for a single payment of £5.95. This gives access to the VectorVest Risk Free 30-day trial, where members enjoy unlimited access to VectorVest UK & U.S., plus VectorVest University for on-demand strategies and training. Link here to view.